Need help caring for an elderly loved one? This sensitive, reassuring guide provides strategies for assessing older persons' needs, arranging for care, ensuring their safety, and enhancing quality of life - all while respecting their dignity. You'll see how to manage physical disabilities and chronic health problems, evaluate nursing homes, and help elders control their destinies. Rachelle Zukerman, PhD (Woodland Hills, CA), is a gerontologist, licensed clinical social worker, and Associate Professor of Social Welfare at the UCLA School of Public Policy and Social Research. Dr. Zukerman taught clinical gerontology as a visiting professor at Hong Kong University and was a 1998—99 Fulbright Scholar to Taiwan where she taught counseling methods for elderly clients and their families. Part I: Entering the World of Caregiving. Chapter 2: The Elderly Are Like Vintage Computers. Chapter 3: Old Age Is a Family Affair: Deciding Who, What, Where, and When. 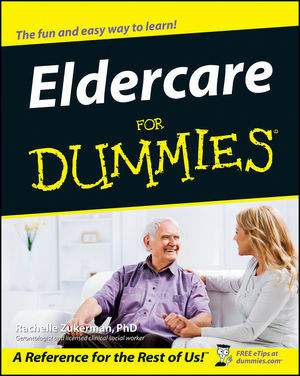 Chapter 4: Where to Turn When Your Elder Needs a New Home. Part II: Mastering Everyday Challenges. Chapter 5: Sleeping Well Means Doing Well. Chapter 6: Helping Finicky Eaters. Chapter 7: Helping Elderly People Be All That They Can Be. Chapter 8: Sharing the Caring. Chapter 9: Growing Closer and Dearer: Improving Relationships. Part III: Keeping Elderly Folks Safe and Sound. Chapter 10: Living Well with Chronic Medical Conditions. Chapter 11: Just Say “Yes” to Health-Giving Drugs. Chapter 12: Protective Doohickeys and Thingamajigs. Chapter 13: Dealing with Leaky Plumbing and Other Incontinence Problems. Chapter 14: Getting Out and About. Part IV: The Blues, the “Good Old Days,” and Other Senior Moments. Chapter 15: When the Clouds Roll In: Dealing with Depression. Chapter 17: All About Alzheimer’s Disease. Chapter 18: Managing the Distressing Behavior and Emotions of Confused Elderly. Part V: Making the Final Years Golden. Chapter 19: When “The Apple of Your Eye” Needs a Peer. Chapter 20: Keeping Your Elder at the Helm. Chapter 21: Keeping the Bill Collector from the Door. Chapter 22: Helping Spiritual and Religious Elderly “Keep the Faith”. Chapter 23: Ensuring a Good Death. Chapter 24: Ten Tests to Help You Assess a Nursing Home. Chapter 25: Ten Ways (More or Less) That Elders Hide Their Feelings.